Liverpool moved back to the top of the Premier League as they beat Cardiff City 4-1. 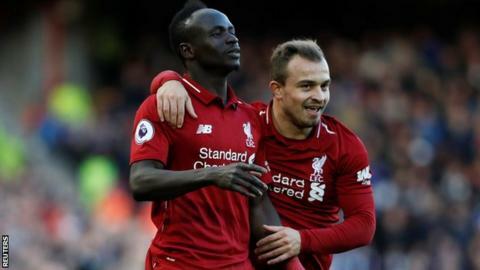 Sadio Mane scored twice and Mohamed Salah and substitute Xherdan Shaqiri were also on target for Jurgen Klopp's side, with Callum Paterson scoring for the visitors. The Reds are three points clear of second place Manchester City, who can return to the top on goal difference if they win at Tottenham on Monday. Roberto Pereyra scored a goal of the season contender for Watford as they beat Huddersfield 3-0, a result which means the Terriers drop to the bottom of the table. Bournemouth maintained their strong start to the season with a 3-0 victory at 10-man Fulham. Callum Wilson was on target twice - either side of David Brooks' goal - while the Cottagers had Kevin McDonald sent off for two bookings with just under 20 minutes remaining. Striker Glen Murray, 35, scored his 100th Brighton goal as they beat Wolves 1-0. Southampton and Newcastle ended in a goalless draw. Leicester host West Ham in Saturday's late game (17:30 BST), with Foxes manager Claude Puel dropping striker Jamie Vardy to the bench. In the Championship, Billy Sharp scored a hat-trick as Sheffield United went top of the table with a 4-2 against Wigan, West Brom missed out on the chance to move into second place with a 1-1 draw against Blackburn, and Norwich continued their climb, sitting third after a 1-0 victory over Brentford. In Saturday's early game, Derby County's Jayden Bogle scored a late own goal to deny the Rams victory at Middlesbrough, who had led in the opening 20 minutes after George Friend bundled into his own net. Kilmarnock drew 1-1 with Hamilton to move above Celtic and into second in the Scottish Premiership.